Thanks to Original Pechanga's Blog for bringing this to my attention. So far it has been hard to find anything online. Pala supposedly issued a press release but I have not been able to find it yet. You can read the full article at the link above. Reality has completely gone Orwellian. PALA – The Pala Band of Mission Indians announced last week that all of the incumbent candidates for the Tribal Council were overwhelmingly re-elected, including Chairman Robert Smith. 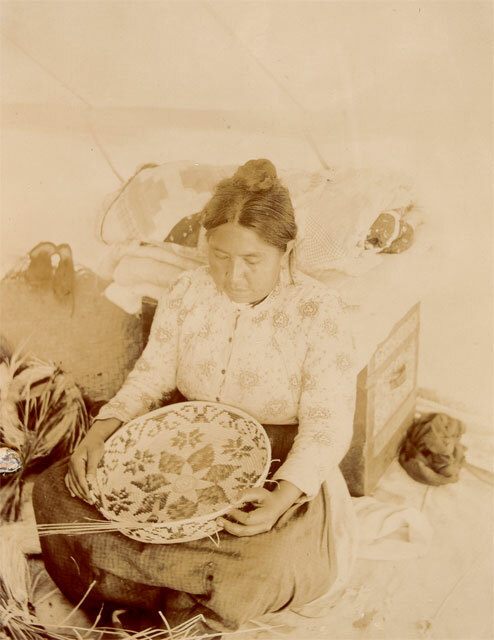 The Pala Band of Mission Indians is a federally recognized tribe whose reservation is located along the Palomar Mountain range approximately 30 miles northeast of San Diego. 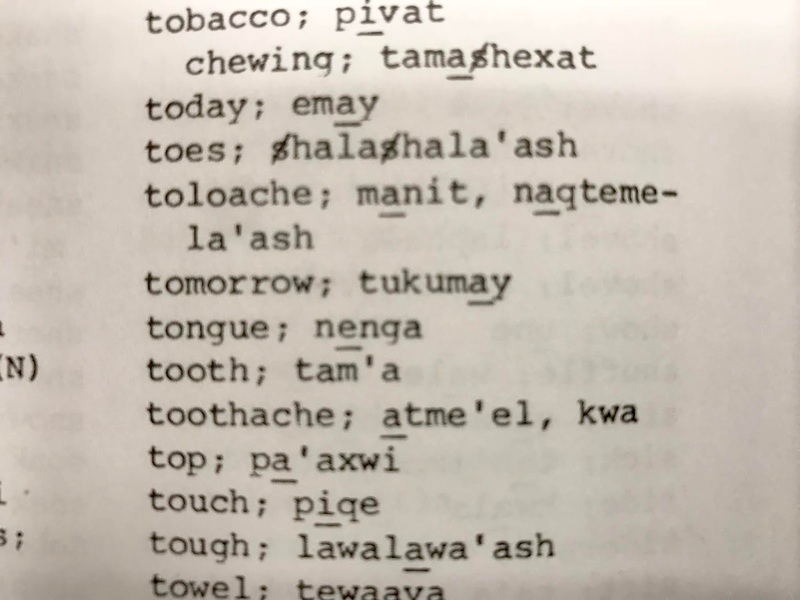 The majority of the over 900 tribal members live on the 12,000-acre reservation, established for Cupeño and Luiseño Indians, who consider themselves to be one proud people – Pala. Click the links above if you want to read the full press releases. It needs to be noted that there are (2) reservations at Pala, not one. The PBMI wss formerly known as the Pala Band of Luiseno Mission Indians. 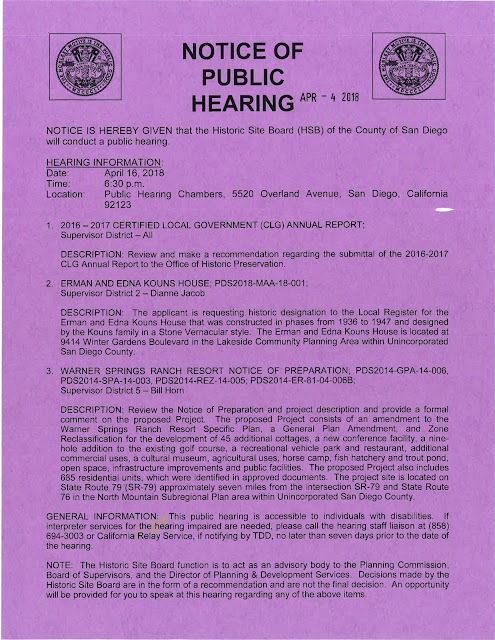 Land adjacent to Old Pala was bought for the Warner Ranch Evictees. The crowd hanging out at the They Passed This Way monument in Old Town Temecula was working phones, the ultimate modern device. 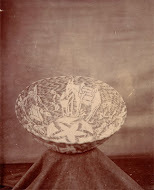 One, Gordon Johnson, also was connected to the Temecula of long ago represented by the monument. The name of John Magee, his great, great, great grandfather is etched there. Magee was quite the figure of late 1800s Temecula. He owned a popular general store, served as the town postmaster and was a judge. Johnson has made a name for himself in modern Temecula. The veteran journalist started writing about the area in the early 1980s as editor of The Californian newspaper. Now he’s making news again with his third book, “Bird Songs Don’t Lie: Writings from the Rez,” a collection of newspaper columns from The Press-Enterprise and nine short stories based on a fictional Native American tribe, the San Ignacio. Read the full article at the link above. There's also a picture. I was emailed the flyers below. I hope the People of Pala vote for change this time. 17 years is too long for someone to be in office especially with such a terrible track record. Jim Ryan, CEO of Pala Interactive and a member of the nonprofit iDEA Growth, submitted a letter this week calling on lawmakers to not overlook the economic benefits of gambling expansion. “Illinois needs to make it legal and regulated. Voting for anything less is a lost opportunity for the state’s economy,” Ryan wrote. Read the full article at the link above. Pala Interactive is a member of this non-profit. Has Pala started issuing Per Cap payments from Pala Interactive yet? Pala investd $100 million in this venture....Any ROI yet? By all reports revenue at tribal operated casinos keeps going up. Tribes all across the country have seen a bounce back since the 2007-2008 recession....except Pala. According to the National Indian Gaming Commission, revenue from tribal casinos has grown from $5.4 billion in 1995 to $32.4 billion last year, representing a rise of 600%. The Indian Gaming Regulatory Act was signed into law by President Reagan in 1988 after the Supreme Court ruled to overturn existing laws on gaming and gambling on U.S. It's hard to say if the Pala Casino has an actual revenue problem where business has dropped significantly - or - if the funds are being mismanaged. It could very well be a combination of both. The only way to find out is to have a forensic audit performed by an Independent Accounting Firm. People need to ask themselves why Pala's tribal government has a larger budget for administering to a village of about 1000 people while many large Southern California City Municipal Governments with tens of thousands of people have much smaller budgets. Where did it all go? Where did the loans go? What investments have been made? Has there been a return on those investments? How many more vehicles does the Pala Government need? How many more private jets? Maybe its time the Executive Committee take a cut in their budgets and stop asking the members to shoulder the burden they created. I will always respect and love King Freeman. He treated everyone fairly. All he wanted was to serve The People and all he wanted was what was best for The People. He felt everyone should be treated equally regardless of what disagreements we may have. He was a shining example to us all, a hard worker, and cared deeply for his family. Apparently Pala's General Council just doesn't want to talk about Pala Interactive, that online gaming venture Robert invested $100 million of the Band's money in. If Pala Casino is doing so bad how is it Pala Interactive is doing so good? Why isn't the Band provided financials about Pala Interactive? Are they making money? Why isn't the Band receiving any Return On Investment (ROI) from Pala Interactive? PALA EXPANDING NEW JERSEY FOOTPRINT WITH BETGENIUS PARTNERSHIP — WHAT’S NEXT? Pala Interactive launched the PalaCasino.com brand in the fall of 2014 and added PalaBingoUSA.com in the spring of 2016. PalaPoker.com launched preliminarily in mid-2017, and completed its full launch in December. Pala Casino offers access to more than 250 online casino games. Pala and Borgata — together again? So Pala already has a triple threat of online gambling angles — might the brass try to make it a quadruple threat? Pala’s online casino gaming and poker platforms come via a deal with Borgata, which just happened to be the first Atlantic City casino to offer sports betting in June and the first to offer mobile sports betting earlier this month. The deal with BetGenius may help Pala with brand awareness, something it has in California but less so anywhere else. California seemed on the verge of legalizing online poker years ago, which presumably was a big factor in Pala’s foray into developing a website and online infrastructure. If online gaming regulation does come to California, Pala will have a leg up on rivals due to its experience in New Jersey. One of these tomorrows will hold a brighter future for Pala. Someone asked what these documents are all about. 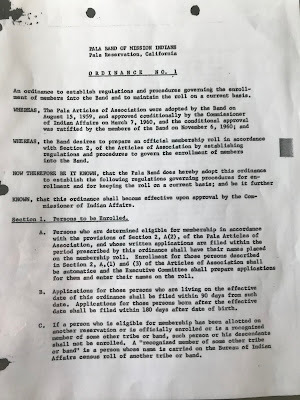 These are Articles of Association and the Original Enrollment Ordinance for the Pala Band. Currently the validity of the Constitution has come under question. If the Constitution is not valid then the Pala Band has been under the Articles this entire time. If this is the case then it means then that the BIA should have never allowed the disenrollments to occur and further they have a fiduciary responsibility to each individual to ensure equitable distribution of the assets. The BIA has instead for 25 years turned a blind eye to the Pala Band and allowed the Executive Committee (mostly Robert Smith) to run amok. Again these are all big "ifs" and it will need to be determined by the proper authorities. Here is a letter obtained by FOIA request from the BIA to Robert Smith. Note that the letter quotes Article IX Section 1 of the Pala Constitution stating that the Constitution shall become effective immediately after its approval by a majority vote of the voters participating in a duly called election. Does anyone remember a duly called election where a majority vote of the voters participated to approve this said Constitution? For those of you so worried about the "tribe's" liability (FYI Pala "Band" is not a tribe") who are spending their time in comments trying to convince the disenrollees to just let it slide...if you are so concerned about protecting Robert and Theresa, don't worry they can hide behind Tribal Sovereignty. We know how much you love Robert and Theresa for all the kick backs you get. The BIA is the agency that may very well be liable for all the damages they have allegedly allowed to occur by neglecting their fiduciary responsibility to individual members. The Constitution was never properly adopted which in my view means the Articles of Association are still in effect. The Articles gives the BIA final authority over Pala's rolls. 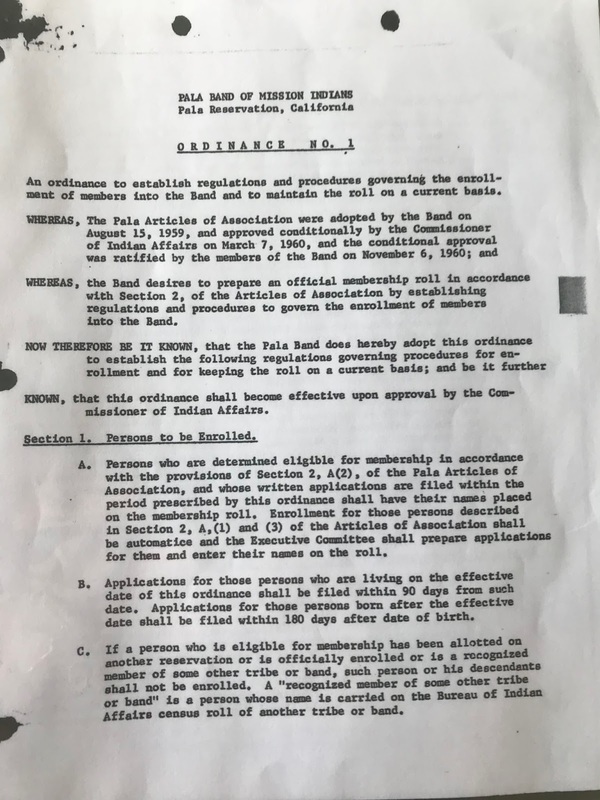 This means that rather than just "recommending" the Pala Band reinstate the disenrollees (which the BIA stated in 2012) they instead had an obligation to not only protect our membership from the likes of Robert Smith, Theresa Nieto, and Leroy Miranda but also to protect the assets all members are entitled to ensuring equitable distribution of such said assets. Note the language below in this letter from Virgil Townsend that includes "...at which this Constitution is approved by the Bureau of Indian Affairs". This Constitution shall become effective immediately after its approval by a majority vote of the voters voting in a duly-called elections at which this Constitution is approved by the Bureau of Indian Affairs". Does a vote of 27 For and 0 against sound like a majority vote of the voters voting in a duly-called election to anyone? 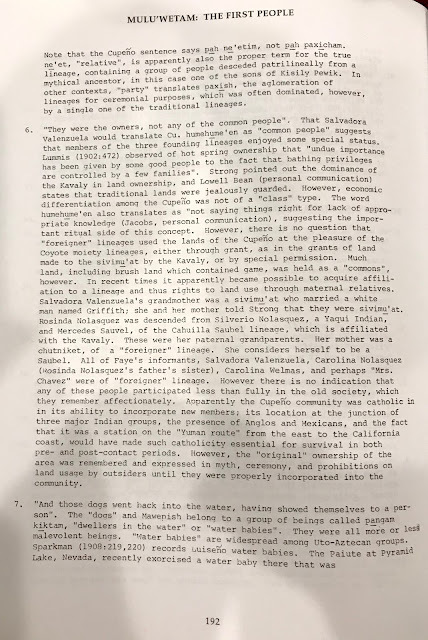 The document below is a piece of history describing friction that exists even up to this day between the multiple groups and one tribe residing at Pala. It's not just Old Pala Luiseno (Band) and Warner Ranch (Agua Caliente) Cupeno (Tribe). There are also Cahuilla (Band), Yaqui (Band), and Iipai (Band) living at Pala as well. If you are confused about the difference between a Band and Tribe you are not alone. The BIA can't keep it straight either. An example would be to consider Luiseno. Luiseno itself is a tribe. But there are many Bands of this tribe living all over Southern California on multiple reservations. The Pala Luiseno are a Band of the Greater Luiseno Nation. 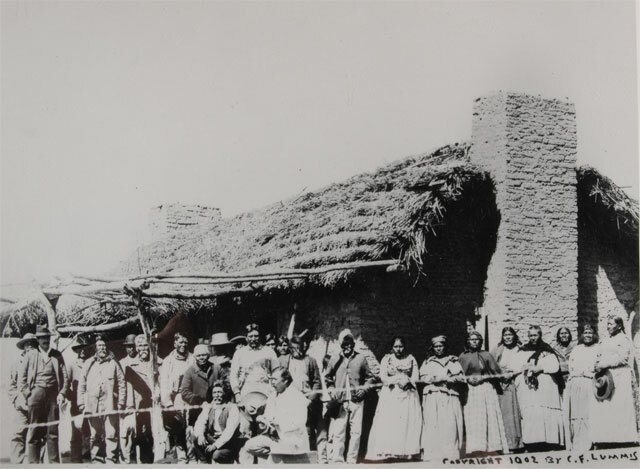 The Cupeno are a tribe historically residing at Agua Caliente aka Warner's Hot Springs (Ranch). The Cupeno as a tribe were forced onto land purchased adjacent to Old Pala's land. Do you think any Robert Smith Pala Money is slushing around in those campaign contributions? Federal prosecutors allege that he and his wife stole $250,000 in campaign funds to do things like take their family to Italy (and buy a three-piece luggage set for it), buy their kids' school lunches, treat family and friends to hotel rooms and wine and golf, and fly a family member’s pet to Washington, D.C., for vacation. Read the entire article at the link above. Below is a letter dated December 11, 1935 from BIA Superintendent John W. Dady. Apparently this Henry E. Smith bought some jewelry on credit and did not pay off the loan. 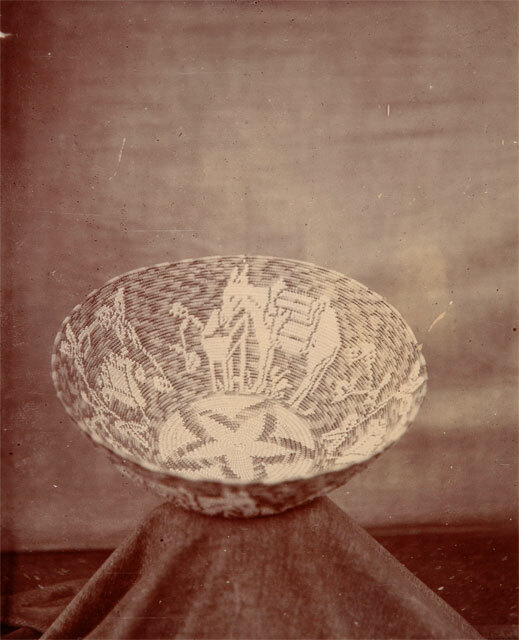 The jeweler then contacted the BIA hoping they could could garnish Henry Smith's wages in order to recoup the loss. "...there is a white man by the name of Henry Smith married to Agnes Moro, a Pala Indian. These people live on the Pala Reservation. I presume he is the same man as the Henry E. Smith you mention in your letter. He lives at Pala by right of sufferage only on account of being married to an Indian..."
London, 18-July: Leander has expanded its exposure to the North American market after signing a distribution deal for its content with Pala Interactive LLC. The deal will see Leander’s extensive catalogue games and those of its partners available for play on the CanPlayCasino offering. An online gaming website powered by the Pala Interactive gaming platform and operated by the Abenakis du Wolinak first nation. Pala Interactive is an online social and real money gaming software development company that was founded in 2013 in anticipation of the burgeoning social and real money gaming opportunity in the United States. Focused on delivering an excellent player experience through our proprietary platforms for our partners and customers, Pala Interactive plans to be a material market participant in both the US online social gaming and regulated realmoney online gaming markets. Pala’s majority shareholder is the Pala Band of Mission Indians which owns and operates the Pala Casino Spa and Resort in Pala, California. JULY 14, 2018 - Irvine, CA - Fox Racing, the global leader in MX and MTB gear and apparel, announces a partnership with the Pala Band Of Mission Indians to create "Fox Raceway." Located in Pala, CA, the Fox Raceway features world-class motocross tracks, an all-new Fox Racing retail store, and many other features that make it the premier motocross track in Southern California. In addition to six beginner to pro-level motocross tracks, Fox Raceway has an all-new covered patio area, a fully stocked Fox retail store complete with product demo and jersey printing capabilities, the first "Jeff Emig's Learn To Moto" center, and a year-round schedule of consumer activations. Fox Raceway is located at 12799 California Hwy 76 in Pala, CA. Hours of operation are Monday-Tuesday and Friday through Sunday from 8am-5pm. “Our full-property remodel and expansion is well underway. The heavy construction is behind us and we are excited to be unveiling these new amenities to our guests ahead of the bustling summer season. We have introduced both new indoor and outdoor bars, lounges and resort spaces that we feel uniquely capitalize on Pala’s beautiful Southern California location,” said Pala Chief Executive Officer Bill Bembenek. One of the new indoor spaces that Pala believes will be popular is the new smoke-free casino space, which is enclosed with glass from floor-to-ceiling. Pala’s HVAC system has been augmented to ensure that positive air flows out from the smoke-free space into the casino area where smoking is allowed. “As part of our casino re-model and expansion, we are paying particular attention to our many guests who prefer to enjoy the smoke-free areas within our resort. We have created a beautifully-appointed casino area that will offer over 300 slot and video poker machines, live poker, casino cashier services and several restaurants and bars. Guests are able to enter the smoke-free casino directly through the smoke-free hotel entrance utilizing our complimentary valet service,” Bembenek said. A member of the La Jolla Band of Luiseno Indians and a former employee of the Tribal Council was arrested Thursday. 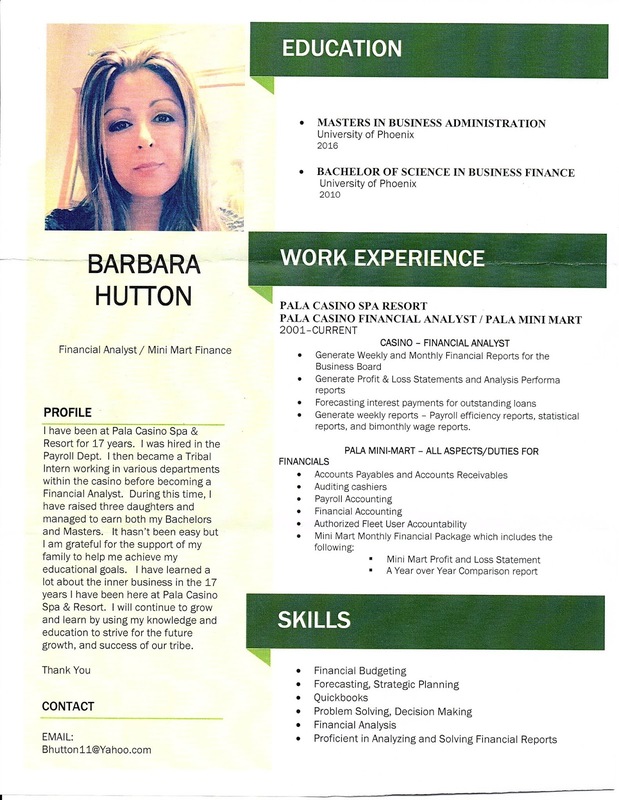 Destiny Nelson, 35, is a tribal member and a former employee of the council who allegedly used her position to embezzle approximately $68,000, according to investigators. 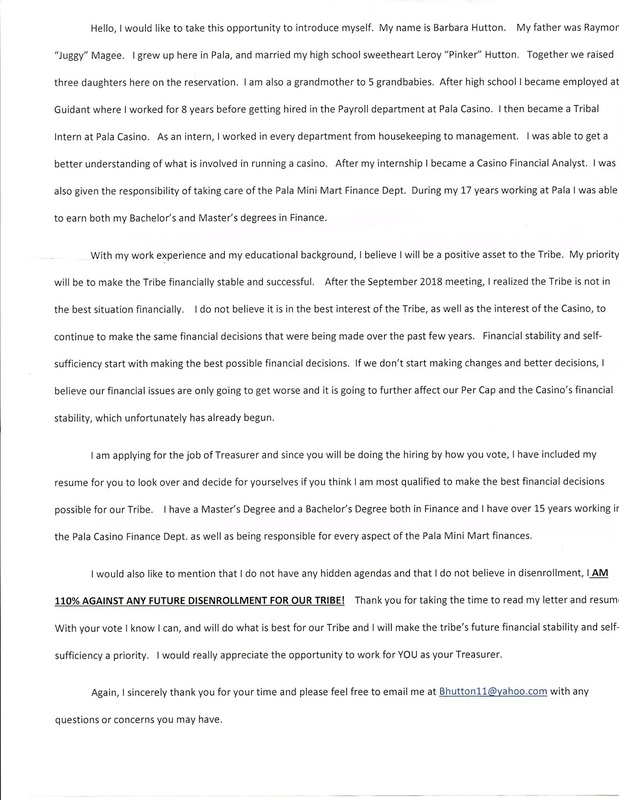 The sheriff's department began investigating this case in September 2017 after the tribal council contacted deputies to report suspicious financial transactions by an employee. Nelson was booked into the Vista Detention Facility on charges of embezzlement, identity theft, forgery and grand theft, according to the San Diego County Sheriff's Department. The La Jolla Indian Reservation is located off State Route 76 in the northeast area of San Diego County at the base of Palomar Mountain. 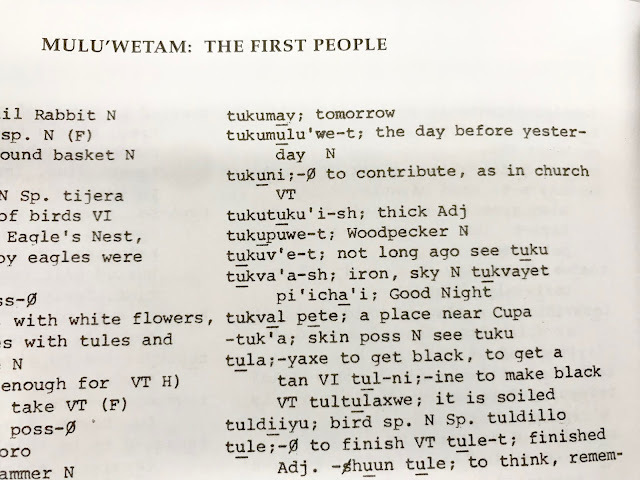 Here are some images of Mulu'Wetam: The First People 2005 Edition page 192. It speaks for itself. Hopefully you can click to enlarge the images and zoom in if you are having a hard time seeing it. You may need to download the images so you can zoom in. The quality should be good enough to read. Notice to all the True Agua Caliente Cupeno and Warner Ranch Evictees out there. Robert Smith is trying to organize people at Pala to go to protest a hearing about Warner's Hot Springs development. This is laughable since Robert Smith is Chairman of the Luisenos. 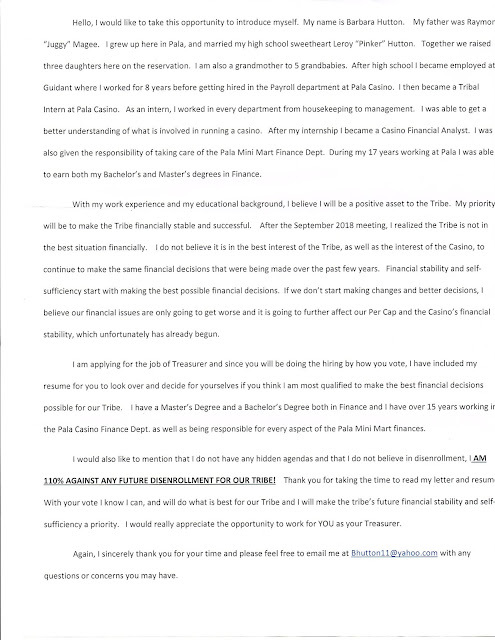 Not only does Robert Smith claim to be the Chairman of the Luisenos but he also has a track record of harassing Agua Caliente Cupeno descendants. He lead the charge on disenrolling 168 Agua Caliente Cupeno. Later when Cupeno elders tried to hold a meeting they were punished and not allowed to ever vote or participate in meetings again. Robert routinely orders Pala Security to harass Cupeno descendants. Many family members who live off the reservation cannot visit their family members who live on the reservation without fear of reprisal. Robert Smith takes action and fines Cupeno for just trying to visit their family and routinely threatens to take their per capita away. Robert Smith destroys Cupeno land and refuses to pay what is rightfully owed. Robert Smith has stolen the per cap of 168 Cupeno for the last 6 years. Hundreds of millions of dollars stolen. Robert Smith has altered the blood degrees of all the Cupeno trying to erase their memory. Robert Smith now has the BIA changing Pala to Luiseno affiliation only. Robert Smith and Theresa Nieto stole the Cupeno Children's Trust Funds. Robert Smith and Leroy Miranda tried to play cute when they had opportunity to buy the Warner's Hot Springs Resort (Kupa). 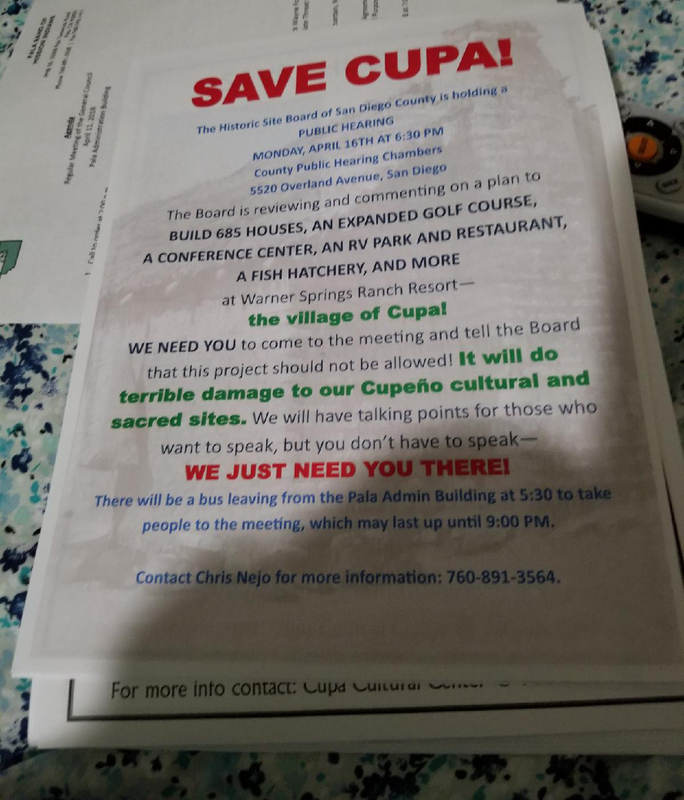 Instead of just buying Kupa, the ancestral homeland of the Cupeno, he and Leroy tried to buy membership shares so they could drive the resort into bankruptcy which they did. There they thought they would buy Kupa cheap but the judge refused to sell to them because of their actions. It's a good thing the judge did that because Robert Smith hates the Cupenos. This is because Robert Smith is from San Felipe while now claiming to be Luiseno. This is a sick joke that Robert Smith is playing where he would dare to organize a group to "save Kupa" when he could have bought Warner's 4 times and each time he balked. He routinely takes action to hurt Cupeno people with disenrollments, sanctions, fines, banishments, and evictions. To all True Agua Caliente Cupeno and Warner Ranch Evictee Descedants please attend the meeting. See the flyer below. Do not let the Fake Cupeno Robert Smith continue to destroy our heritage! And don't forget! Robert Smith is the one who put that fence around the Cal Rossi Trust next to Kupa. In the process he destroyed all sorts of Cupeno artifacts and violated the land. Robert Smith is no friend of the Cupeno and should never be allowed to set foot at Kupa (aka Warner's Hot Springs/Agua Caliente) ever again let alone try to organize a protest? What is Robert protesting? There is nothing more that Robert Smith loves than seeing the destruction of Cupeno sacred sites. Robert is probably secretly in favor of the developments and is just trying to shake the money tree of the owners. Indian History in the Pala Valley can get complicated. There were Pala Luiseno living in the Pala area prior to The Agua Caliente Cupeno Removal of 1903. After the Agua Caliente Cupeno Removal in May of 1903 a separate lawsuit against the San Felipe Indians worked its way through the courts. In October of 1903 the San Felipe Indians were also moved to Pala. 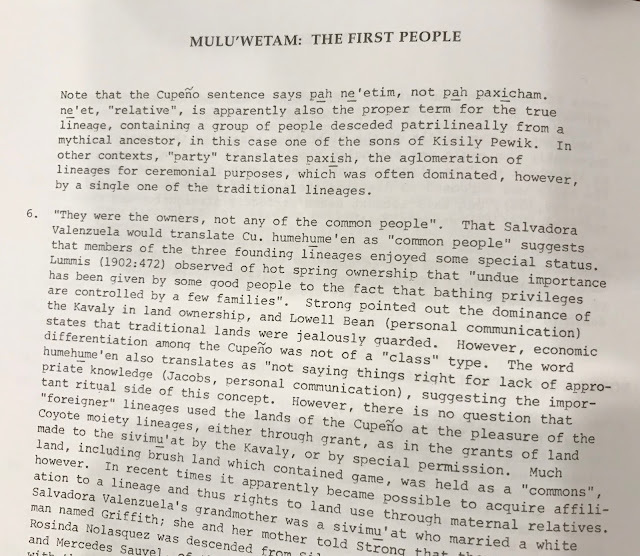 As the allotment process began some other Indians not associated with either the Pala Luiseno, Warner Ranch Evictee Agua Caliente Cupeno, or the San Felipe Diegueno began to show up and got allotments.. There has always been tension between these groups particularly when it came to land use, allotments, and later on, membership. The official name of Pala on the Federally Recognized list of Indian Tribes was Pala Band of Luiseno Mission Indians of the Pala Reservation. That name got changed illegally to Pala Band of Mission Indians (PBMI). So what is the PBMI? Luiseno? Cahuilla? San Felipe? Yaqui? Cupeno? What are the People at Pala now? Is it just one group? Have all the other tribes been terminated? Lot's of rumors floating around. I am hearing the expansion is now on hold. Where is the money? Was the loan secured? Or did Pala (aka Robert) never even get the loan in the first place? I am also hearing more per cap cuts are coming. 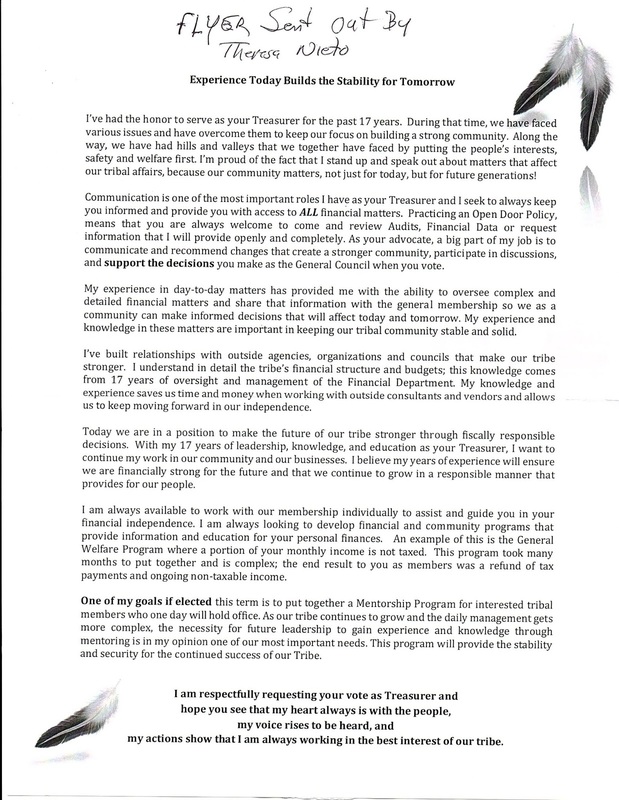 Seems there is a ton of tribal administration that could get cut before tribal members should be forced to take a cut. How much longer will everyone keep voting in the same people only to watch the casino go down the tubes? Looks like Pechanga is eating everyone's lunch including Robert's. 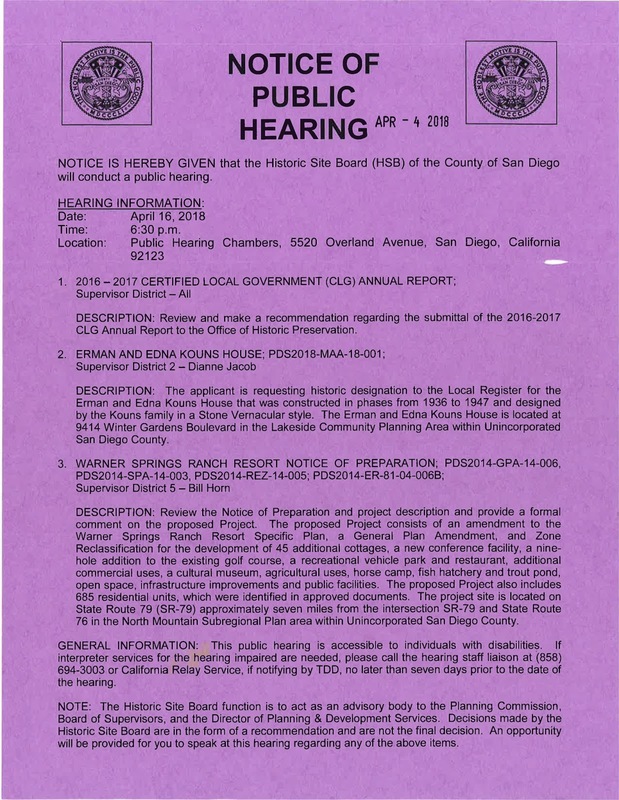 LINK: Is San Diego's casino industry over-saturated? Including Pechanga and Pala, a total of six local casinos have been undergoing expansions, with Barona Resort & Casino, Sycuan Casino, Valley View Casino & Hotel and Viejas Casino & Resort adding hotels, restaurants, spas, casino space and hundreds of thousands of square footage to their properties. Longtime Las Vegas-based Indian gaming expert Dave Palermo said he’s not surprised that San Diego’s current casino building-boom bubble could be bursting for some. Please click the link above to read the full article. It is very informative. 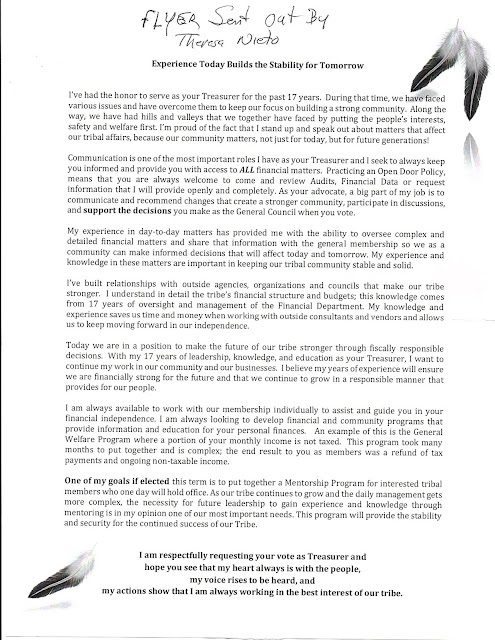 Every tribal member should read it. Condolences to the Freeman Family, God Speed Nikki. You are loved. There's an Old Pala that has existed probably long before there was even a Pala but that's another story. There were and still are indigenous people living around Old Pala. They are called Luiseno. They were Mission Indians under the jurisdiction of the San Luis Rey Mission. They are a band of Luiseno. There are many Luiseno bands around Southern California. Many people at Pala have a mix of Luiseno blood. The Luiseno reservations are Soboba, Pechanga, Pala, Pauma, and Rincon. In 1852 the Pala Luiseno singed a treaty with the U.S. Government. They were granted a reservation in 1875. In 1895 some Pala Luiseno were allotted land. This land was and continues to be recorded separately as part of the Old Pala Reservation. 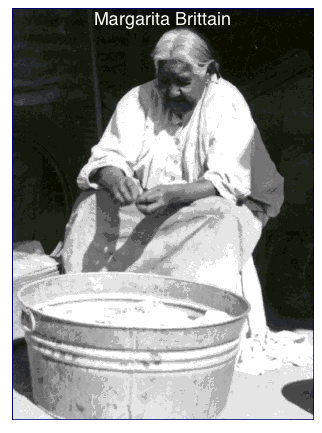 There is another Tribe of indians called the Agua Caliente Cupeno. These were not Mission Indians. By all accounts they were hard working self sufficient people. 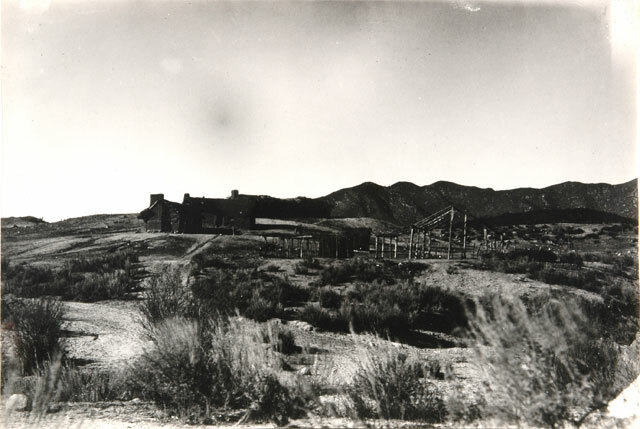 The traditional homeland of the Cupeno is the village at Kupa also known as Warner's Hot Springs and before that Agua Caliente. The Agua Caliente Cupeno continued to reside on their ancestral homeland until 1903 when due to a Supreme Court ruling the Cupeno were forced off their land. The U.S. Government in all its wisdom decided purchasing land right next to the Old Pala Luiseno Reservation was a good idea. There were other tracts of lands considered such as Monserate but in the end the old Salmons Ranch was purchased for the Cupeno. There was a provision in the law that said something like the land was purchased for the Agua Caliente Cupeno (Warner Ranch Evictees) and other landless indians that had no home. This created sort of a land grab as people just showed up at Pala. 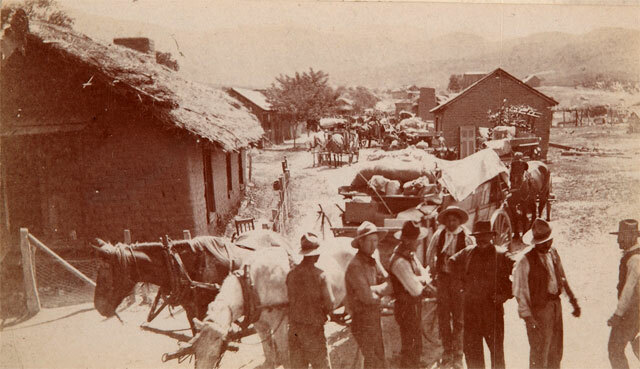 In May of 1903 several villages around Kupa were moved to Pala. In October of 1903 another tribe was forced to move to Pala. These were the San Felipe Indians, Iipay or Digueno. This was a separate lawsuit and separate removal. One Cupeno legend is of Kisily Pewish. His mother was Luiseno from Soboba and Father was Cupeno. One day the "Southerners" or Digueno massacred everyone at the Village of Kupa except for Kisily Pewish and his Mother. They went back to Soboba where, just to short hand the story, Kisily grew up and retook Kupa from the Southerners by killing them all with the help of his magical bear and his mother. So, the BIA in its infinite wisdom decided putting the Agua Caliente Cupeno next to the Pala Luiseno and then mixing in Iipay was a good idea. Initially the BIA tried accounting for all the Indians separately. There are Luiseno, San Felipe, Cupeno, Cahuilla, and Yaqui all at Pala as well as some others. But as time went on to make administration easier on themselves the BIA just tried to say everyone was Pala. But tensions always arose and continue to this day among the different tribes and bands at Pala. 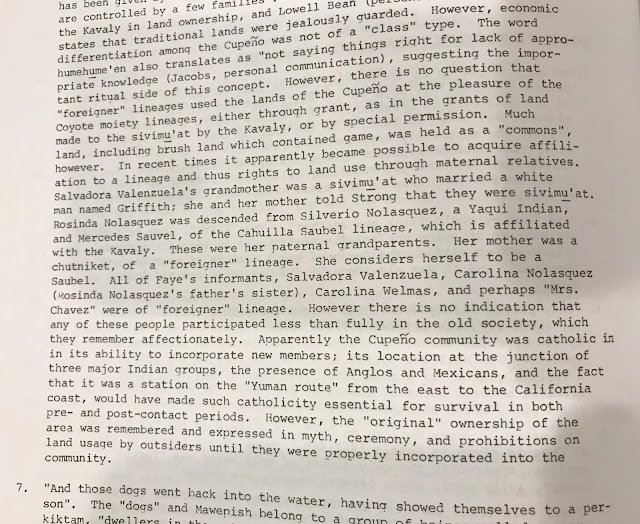 The Agua Caliente Cupeno historically have governed themselves through Custom and Tradition through Family Relationships. This continues to this day. However, in the 1960's the BIA forced the indians at Pala to abandon any official relationship with their blood lines and tried to merge all the blood into one calling it "Pala Blood" or blood of the band. This was an association of bands and tribes and not one tribe. The problem with this, and the BIA knows it, is that it is against the law for one tribe to determine the membership of another (see Santa Clara Pueblo v. Martinez). This is precisely what is going on at Pala to this day. We have non-Cupenos deciding who are members. They are even changing blood degrees against the recommendations of the U.S. Government. What gives them a right to change anyone's blood degree? 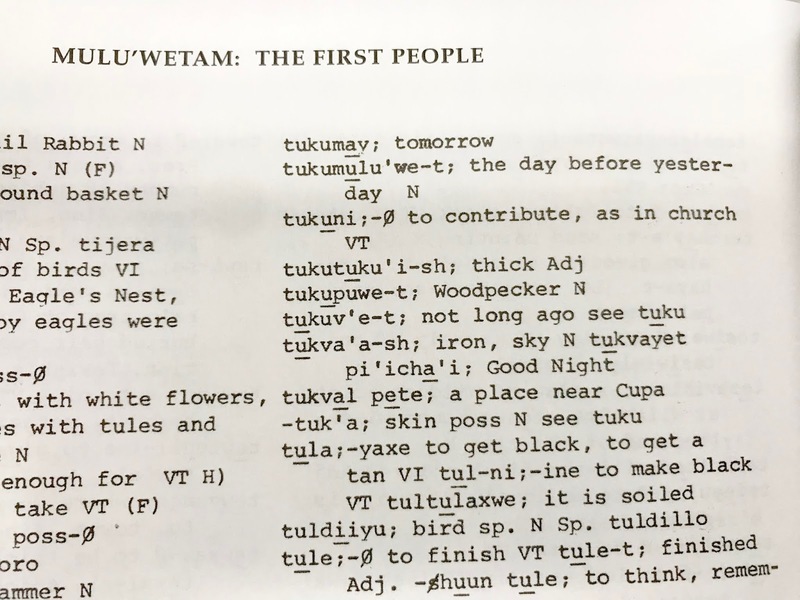 Further, in the 1960's, the Cupeno at Pala knew there were several tribes at Pala. Thus they pushed to be included in Enrollment Ordinance No. 1 a provision not allowing tribal members to belong to more than one tribe. See below Section 1c. The Agua Caliente Cupeno have always pushed for Kupa blood to be counted and the BIA has always denied it. 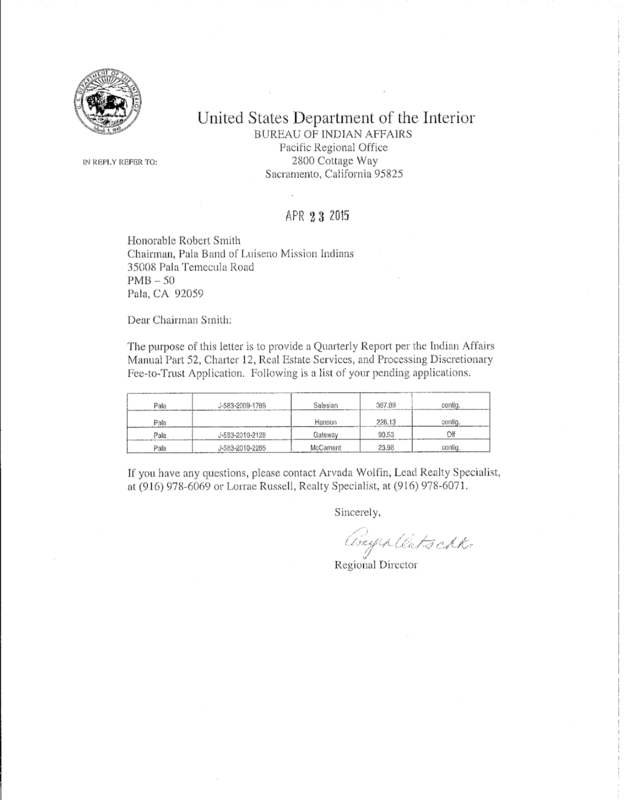 Now, the BIA has changed the name of the Old Pala Luiseno to the Pala Band of Mission Indians illegally. That means technically Pala is now a 132 acre reservation with 800 acres of grazing rights all the rest belonging to the Agua Caliente Cupeno as well as other Warner Ranch Evictees. But for whatever reason the BIA does not see it that way. Go figure. I was sent an article for consideration and asked if I would post it to the blog. I decided I would. The views, facts, and opinions expressed in the article below are strictly the views of the [ANONYMOUS] author. The views and opinions expressed in this article are those of the [ANONYMOUS] author and do not necessarily reflect the views of Pala Watch. intended for permanent use and occupancy. children were never allotted land but were still considered members of Old Pala. NOT a tribe. This name only recognizes them as Indians in the San Luis Rey Mission District. They may be a band from the Kumeyaay. Old Pala is a reservation that never had any form of government or a tribal committee. Robert Ardilla would act as Captain or Spokesman. between them and Old Pala. schedule which allowed a specified amount oftime and water to be given to each crop grower. of the Rincon Reservation. She was denied because of her membership to Old Pala. third request she was voted in, along with her whole family which would include Robert Ardilla. according to the Articles of Association (for Agua Caliente) this was a requirement to be enrolled. BIA records from March 7, 1940 show that Marion Scott is an enrolled from Old Pala. Caliente (Cupa) then have complete control of their allotments? government to government relationship between the Agua Caliente (Cupa) Tribe and the United States. reservation for the Agua Caliente tribe to live on as their ancestral homeland. Springs since the time of their creation. Rutherford B. Hayes revoked this. This land revocation lead to the removal from Warner's Ranch. There were many sites considered when deciding where to send the Agua Caliente (Cupa) tribe: Rancho Santa Margarita (Camp Pendleton), Panky Ranch and Pala. Because Pala had a mission and the Agua Caliente Tribe had a small chapel near Warner's, Pala Valley was chosen. of the Agua Caliente tribe. When the Agua Caliente (Cupa) tribe arrived in Pala in 1903 they were put in tents until the prefabricated homes would arrive. 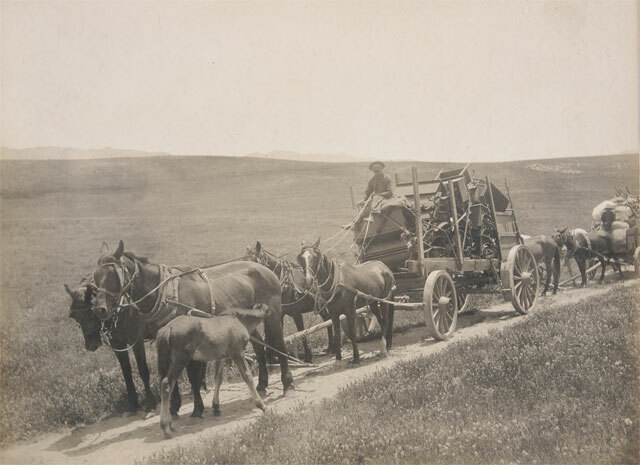 These homes came from New York, traveling around the Cape to San Diego and eventually make their way by wagon to Pala. Pala was set up like the village at Warner Springs. The head of each household was given an allotment for a home, 1.75-2 acres on the irrigation system, and 5-6 acres of land for dry farming. became referred to as Pala Band, Pala Band of Mission Indians or Pala Band of Luiseno Indians. change, why not change it to Agua Caliente Indian Reservation like it was when they were moved from Warners? And furthermore, why is Robert being referred to as Chairman of the Luiseno Band of Mission Indians? He has no authority to be their spokesman. simply from moving from one location to another? If it's that simple to rename the tribe PBMI it should be just as simple to give them their correct name back. Pala Band of Mission Indians is not a tribe. wagon owned by Remijio Lugo. direct descent from Agua Caliente (Cupa), which is a requirement for enrollment with them. lot of people but it is something that should be known.